The final siren sounds with the Fremantle Dockers too good for the Western Bulldogs, beating them by 38 points. BEHIND DOCKERSCrowley tries a long one to really cap off the match, but it bounces to the right of goal. GOAL DOCKERSPavlich marks with his trademark strength and finishes the game on a high. He has kicked 6 goals and is almost in career best form. Higgins limps off with injury. Lets hope he is available for next week with the Bulldogs facing the Hawks. GOAL BULLDOGSMinson outmarks Bradley and marks 20 metres out. He goes back and kicks the goal. 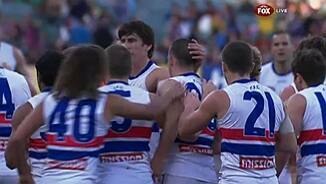 It's all too little too late for the Western Bulldogs. GOAL DOCKERSMcPharlin handballs to Hill who keeps running and kicks a nice goal to apply the icing on the cake. Dockers lead by 37 points. GOAL DOCKERSPavlich applies the tackle deep in attack. The ball spills free to Mayne and he kicks his fourth. GAME OVER! BEHIND BULLDOGSHoward tries one from distance, but he misses to the right. BEHIND DOCKERSMundy punches it through for another rushed behind. The Bulldogs have the onus on them to do something. The Dockers just have to keep the ball off them and wait. GOAL DOCKERSHill's shot falls short and Mayne takes a juggling mark on the boundary. He opens up the angle and kicks the goal. BEHIND DOCKERSMundy punches it through for a rushed behind. It has been a tough and willing start to the final quarter. GOAL BULLDOGSDickson's arms are taken out at the marking contest and he will kick after the siren. He lines it up and kicks the goal. Dockers lead by 22 at three quarter time. BEHIND DOCKERSPavlich marks on the boundary and lines it up, but he hits the post. GOAL BULLDOGSGilbee breaks the line and kicks long where Dickson beats of Roberton and kicks a good tough goal. GOAL DOCKERSMarkovic's kick misses the target and goes straight to Lower. He thinks it's his birthday! He runs in and kicks the goal. BEHIND DOCKERSCrowley's kick from the boundary comes back, but not far enough. BEHIND DOCKERSGilbee rushes it through for a behind under pressure. GOAL BULLDOGSMcPhee kicks in between two Dockers deep in defence. Neither of them get it as it goes to Griffen who snaps it through for a goal. GOAL DOCKERSGriffin runs out of defence and takes two bounces. He kicks long to Pavlich who marks. He goes back and the kick is simply perfection in the kick of a footy. Fremantle make their substitution with Grover unable to recover from the heavy fall. His place is taken by the designated sub in Duffield. The Bulldogs are not getting their hands on the ball. It's as simple as that at the moment. GOAL DOCKERSCrowley slides in soccer style as if meeting a cross from a corner. He meets the ball perfectly to give it the spin required to bounce through for a goal. GOAL DOCKERSGrover lands heavily and is paid the free kick. He is unable to take it with Mayne the closest. He goes back and splits the middle. 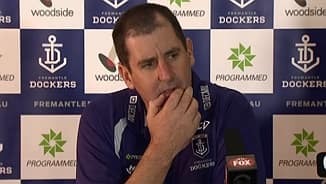 Dockers by 19. GOAL DOCKERSPavlich is held in the marking contest and he is paid the free kick. He plays on and slams it 17 rows back. GOAL DOCKERSBradley kicks a high ball to Pavlich who uses his strength to mark. He goes back and guides it through. Dockers by 7 points. BEHIND BULLDOGSDickson pounces on a Dockers turnover, but his shot misses to the right. BEHIND BULLDOGSDickson handballs it out to Dahlhaus who snaps, but misses to the right. The siren sounds for halftime with the Dockers leading by 3 points. We are set for more of the same contested and tight footy in a second half that promises a close finish. BEHIND DOCKERSBroughton takes a good mark 30 metres out. Shame about the kick. The Dockers have missed three relatively easy shots at goal this afternoon. This match remains tight as a contest and on the scoreboard. It could provide some nailbiting tension in the coaches' boxes and in the crowd before the match is out. GOAL DOCKERSde Boer kicks to Pavlich who marks 45 metres out directly in front. He splits the eye of the needle for his second. More importantly the Dockers are back in front. GOAL BULLDOGSThe ball is kicked inside 50. It bounces and clears them all. Handball comes out at ground level to Dickson who kicks through traffic for a goal. The Doggies are in front! The Bulldogs are enjoying a good second quarter. GOAL BULLDOGSHiggins is tackled but the ball spills free. It is pushed forward where Dahlhaus pounces. He doesn't need an invitation and he kicks his second goal. BEHIND BULLDOGSSherman runs hard to take the mark with outstretched arms. The shot at goal seems to move contrary to the breeze and it hits the post. GOAL DOCKERSMarkovic has his hands in the middle of Broughton's back and the Docker has the free kick. He goes back and kicks the goal. BEHIND DOCKERSMzungu handballs to Pearce who kicks it across the face for a behind. GOAL BULLDOGSSome great work by Higgins in mid air by tapping it to Dahlhaus who runs in to kick the goal. Bulldogs within 2 points. The Bulldogs do not appear to be interested in kicking long to the forward line. They want to run it in with no clear tall target up forward. BEHIND DOCKERSGriffin becomes provider as he passes to Barlow. From 30 metres out, his kick is disappointing and misses to the right. BEHIND DOCKERSGriffin marks 25 metres out with not much angle. He misses it to the right. The Bulldogs keep kicking the ball short and appear to be kicking into the wind. GOAL DOCKERSMayne is infringed upon in the marking contest and kicks the goal after the siren to give the Dockers a 7 point lead at quarter time. BEHIND DOCKERSPavlich has it bang on the boundary. He lines it up. It comes back beautifully, but it hits the post. BEHIND BULLDOGSJohnson punches it through for a rushed behind. GOAL BULLDOGSGilbee runs to the edge of the 50 and handballs over the top to Higgins whose kick under pressure is a good one. It's great in fact. Never looked like missing. BEHIND BULLDOGSMinson marks on the lead but his kick goes left to right to hit the post. GOAL DOCKERSFinally, we have a goal on the board and who else but Matthew Pavlich to get the scoring underway. Mayne handballs inside to him and he kicks around his body for a goal. It's been a slow start to the match with the Bulldogs employing numbers down back. Bulldogs have not had much time inside their own 50 either. Just happy to defend. BEHIND DOCKERSCrowley chimes in to take the mark, but his shot misses to the right. BEHIND DOCKERSMayne marks well on the lead but appears to have landed awkwardly. His shot misses to the near side. Patersons Stadium will see the conclusion of a very interesting round 15. 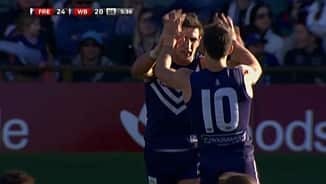 The Fremantle Dockers host the Western Bulldogstwo teams looking to keep their finals hopes alive.